Enjoy autumn leaves in places surrounded by nature over an hour’s trip from Kyoto Station! The classic spots close to Kyoto Station and the minor ones off the beaten path are all nice, but maybe you would like to know about some places that are a bit further away? These spots are an hour or an hour and a half away from Kyoto Station, but because they are away from the city center, these spots are surrounded by nature, and the beauty of the autumn leaves stands out even more. Even if it takes some time, you should still try to go to these places! From Kyoto Station, it takes a little bit under an hour by bus and train to get to the quiet mountain village of Ohara. The most famous temple in Ohara is Sanzen-in, which is surrounded by mountains making the air here feel clear. 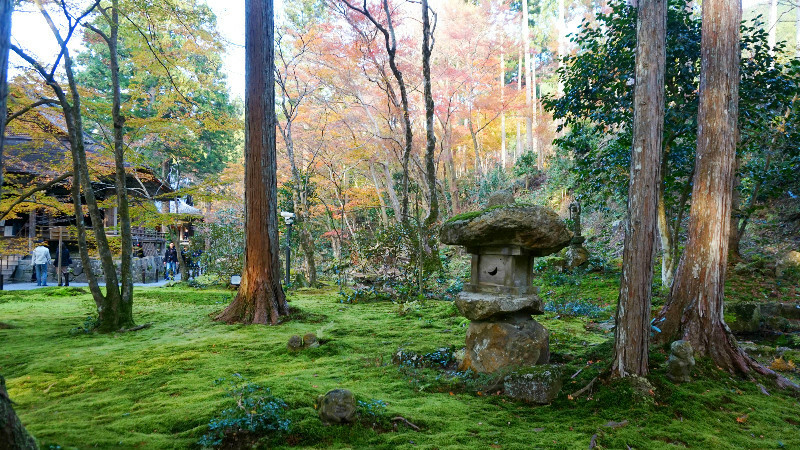 Sanzen-in is known as a great place to view autumn leaves, and it has two moss gardens which in autumn are colored red and yellow by the autumn leaves. Because Ohara is farther north than many other sightseeing spots in Kyoto the autumn leaves period here starts earlier. The autumn leaves of Ohara tell of the coming autumn to Kyoto. Best time for the autumn leaves: Beginning to the end of November. Kurama Temple can be reached in about an hour from Kyoto Station by Eizan Electric Railway. This temple is located on Mt. Kurama, and it takes around 30 minutes to walk from the main gate to the main hall. Nature here is beautiful, and you can enjoy it and the autumn leaves while you walk up the mountain. There is also a cable car to the main hall, but we would like to recommend you walk up the mountain to fully enjoy the autumn leaves. If you are feeling like exercising, the route from the main hall to Kifune Shrine is a nice hike. Kifune Shrine is located in north Kyoto, and the shrine enshrines the god of water. The Kibune River runs by the shrine, and temperature at the shrine is lower than in the city, and the air feels crisper. 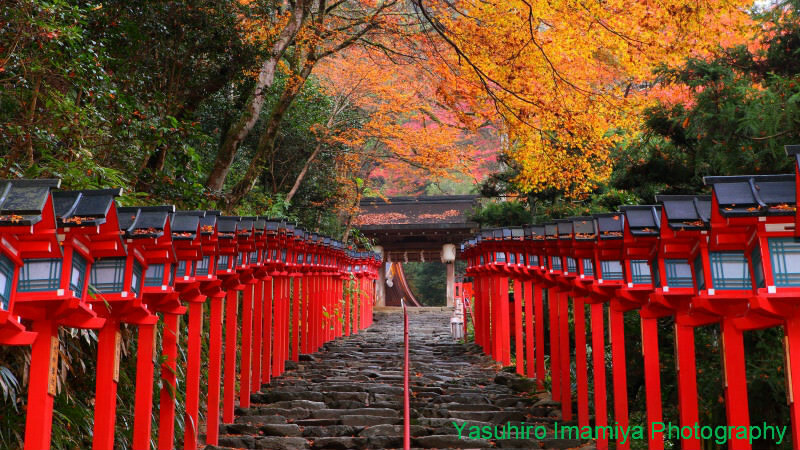 In autumn you can enjoy the contrast between the autumn leaves and the red wooden lanterns lining the path to the shrine. They also hold illumination events at night, which are very popular among tourists. The easiest way of getting to the temple is by taking the Eizan Electric Railway, and from the windows of the train you can already enjoy autumn leaves, so you can enjoy them on your way to Kibune, in Kibune, and even when you go back from Kibune. Like Sanzen-in, Hosen-in is also located in Ohara. 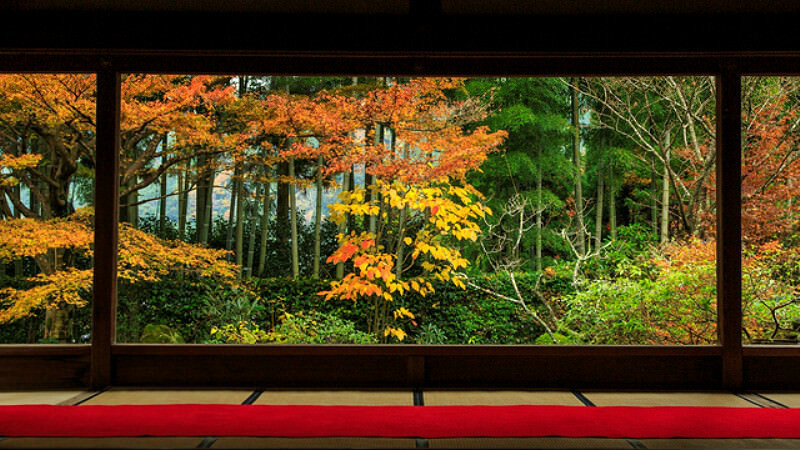 The view you get from inside the temple from in between the pillars makes it seem like you were looking at a painting, earning Hosen-in the name “Painting garden.” The beautiful nature of Ohara and the mountains as borrowed scenery make the garden beautiful any season of the year, but the garden is at its absolutely most beautiful during the autumn leaves season. The beautiful nature of Ohara is worth the trip, even if it takes some time. The Takao area in Kyoto is also quite famous as a place to see the autumn leaves. The area has been known for its autumn leaves since the Heian period, around thousand years ago, and the area surrounded by the three mountains Mt. Takao, Mt. Makio, and Mt. Togano is breathtaking. In autumn all three mountains are lit in fire by the red of the leaves, and you can enjoy a luxurious autumn leaves hiking course in Takao. 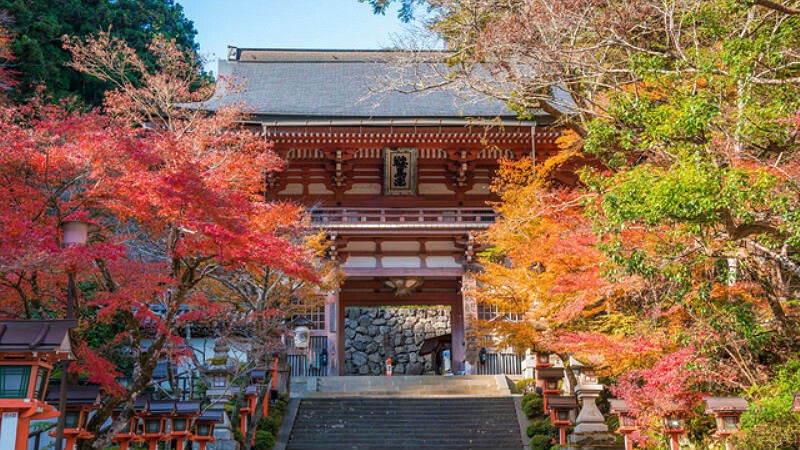 There are also many temples in Takao, like Jingo-ji, Saimyo-ji, and Kozan-ji, where you can enjoy the combination of historic temple architecture and autumn leaves. These autumn leaves spots may be a bit far from the city center, but they are all worth the travel time required. And the best thing is, the autumn leaves period starts earlier here than in the center of Kyoto, so these places are great for both those who want to enjoy nature, and for those who want to get a jumpstart to the autumn leaves season. 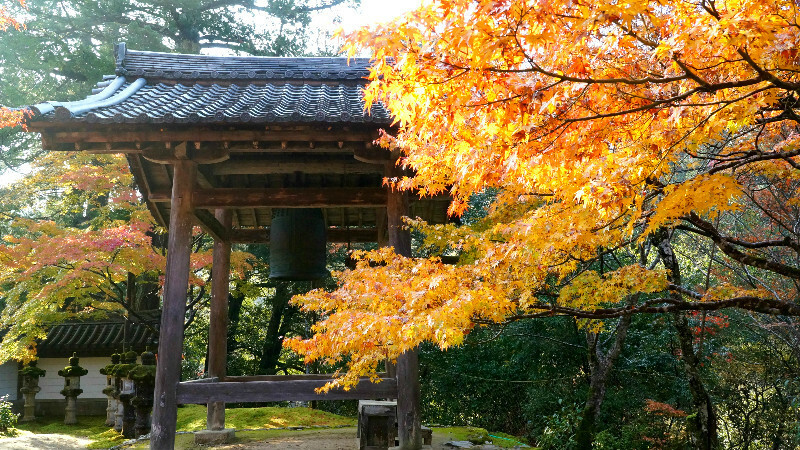 In this article, you got to know about many great autumn leaves spots in Kyoto. It may be hard to decide where to go in Kyoto because there are so many great autumn leaves spots, but if you read this article, I’m sure that it can help you decide on where to go to. Your trip is sure to become unforgettable!